Dumfries Cricket Club is in the middle of a programme of coaching in local schools. And, this week, pupils at Aimsfield Primary were again under the watchful instruction of ECB Coach Jonathan Osborne. The programme is aided by grant funding from Cricket Scotland and the D&G Junior Cricket Development Group. As a result, a number of local primary schools have, and will, over the rest of the summer term, receive free cricket sessions delivered through the Club. This coming Saturday is the second round of league games. APD Dumfries travelling to Stirling in the Western Premier and Eco-Genics Nunholm hosting their Stirling counterparts, Williamfield, at home in the Reserve League. After last weekend’s rain affected cancellations Dumfries will be aiming to start off with a win in their defence of their Western Premier title. APD Dumfries also play their first group game in the new CSL40 Cup competition against Stenhousemuir at Nunholm on Sunday. On Wednesday Peter Lojszczyk was selected for the Border Reivers in the new LiveSport.co.uk Scottish Pro Series in another, unfortunately, rain curtailed match against the other team, the Highlanders, at Titwood on Wednesday. The Pro series aims to provide the platform for the introduction of professional cricket at domestic level in Scotland and the establishment of a first class structure in future years. The player with the most games played this year at the Club is Kirsty Strachan. 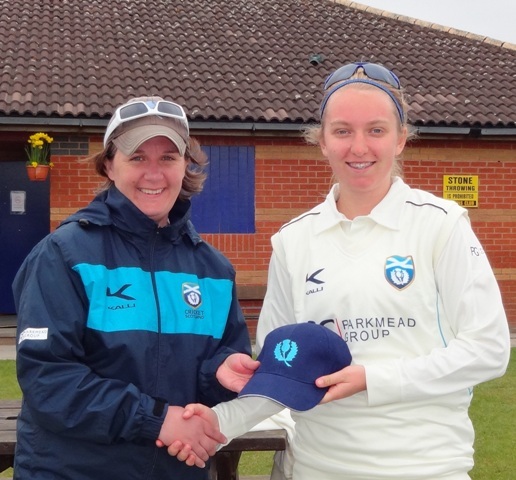 She was formally awarded her Scotland Cap last week when she made her full debut for Scotland Women in their game against Leicestershire and a win over Derbyshire. She becomes the first Nunholm player to achieve a full Scotland Cap. The Dumfries Women’s side make their debut in the National league on Sunday with a fixture in Edinburgh against George Watsons. Those interested in trying out a new sport are encouraged to contact the club about Women’s and Girls cricket at Nunholm. Coaching: Monday night junior sessions for boys and girls take place at Dumfries Sports Club, Nunholm, from 6:15-8. The Club’s Womens’ and Girls training takes place on Fridays from 5 to 7. 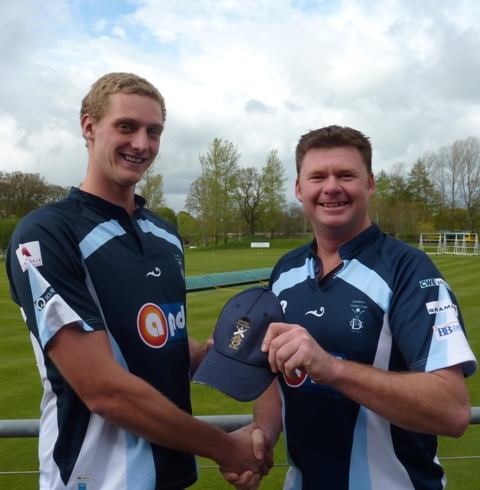 For more details contact Trefor Williams on 01387 256455, or contact the Club on 07799 856094, dumfriescricketclub@gmail.com , or see www.dumfriescricketclub.co.uk, www.twitter.com/dumfriescricket .